We’d love your help. 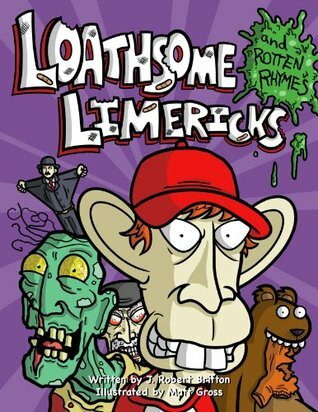 Let us know what’s wrong with this preview of Loathsome Limericks and Rotten Rhymes by J. Robert Britton. Here are some poems you’ll love to hate. Funny and kinda gross. Short rhymes amply illustrated by Caaats! Cartoonist Maaat! Gross. Limericks and rhymes from someone who ought to know better. This simple ebook is the latest from the heavy weight talent pool at Hippocampus. We also recommend staying out of THAT pool. We rated this material as PG-10, about the emotional age of Here are some poems you’ll love to hate. Funny and kinda gross. Short rhymes amply illustrated by Caaats! Cartoonist Maaat! Gross. Limericks and rhymes from someone who ought to know better. We rated this material as PG-10, about the emotional age of the authors. To ask other readers questions about Loathsome Limericks and Rotten Rhymes, please sign up.